Celebrating the rich collaborations between jazz and hip-hop through soulful performances from some of Atlanta’s finest artists. Featuring music director and acclaimed drummer Landon Anderson (Kool & the Gang, Dougie Fresh, Roy Ayers) serving as music director and backing Atlanta arts collective, Soul Food Cypher, Atlanta Hip-Hop legend Dres The Beatnik, M.C/producer Yamin Semali, Grammy Award-winning producer DJ Kemit and others. Hosted by Jason Orr of the legendary festival the FunkJazzKafé and co-hosted/curated by award-winning radio host Jamal Ahmad. 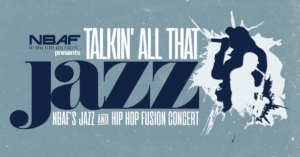 This will be a fun evening as we celebrate the parallels and partnerships between jazz and hip-hop culture. Featuring songs that span from the 60’s to the ’00s, this will be an intergenerational and unique concert experience. 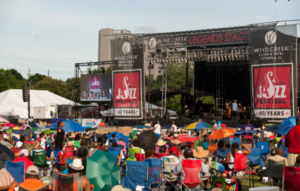 Don’t miss the fun and excitement at the annual Atlanta Jazz Festival in Piedmont Park, May 25 and 26 as NBAF showcases fine art from some of Atlanta’s most talented artists. The festival showcases local and national jazz greats, a neighborhood jazz series, youth jazz band competition, a kids zone, and many other family-friendly activities in one of the country’s largest free jazz festivals. 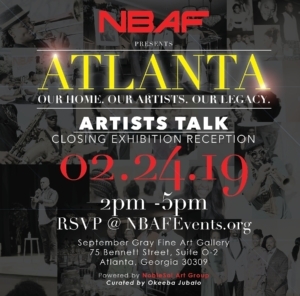 Join NBAF as we celebrate the amazing talents of Atlanta artists by hosting a mini visual art exhibit at the Atlanta Jazz Festival during Memorial Day weekend. This professionally curated mini-exhibit will feature 7 acclaimed, local artists in an air-conditioned, inflatable 26 x 26 ft tent in Piedmont Park and will provide festival attendees with the opportunity to experience visual art while enjoying jazz in the park. Please come out and enjoy the festivities at this inaugural premier art event with NBAF. We are excited to see you there as we continue with our mission to expose the community to the phenomenal art of artists of African descent! Music line up and fine art show details coming. To make sure you never miss an update, click here. NBAF will present, “Local Celebrity”, a 3 day stage play by Creative Director, DL Warfield, Artistic Director, Devyn Stephens, and Mixed Media Director, Christian Ruffin. This performance art piece is a hybrid traditional stage play, tone poem and musical and is a Cirque de Soleil inspired performance piece told from the point of view of a P.O.W. in Iraq. 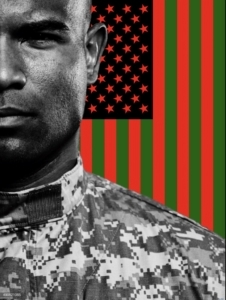 “Local Celebrity” breaks down America’s struggle with narcissism, social media overkill, and celebrity obsession while the real heroes are nameless, faceless soldiers who are dying overseas. Contemporary pop culture gets harsh scrutiny in this satirical social commentary that plays out in a series of monologues, poems, scenes, dance sequences, and musical interludes. Tickets will go on sale September 2019. In case you missed this beautiful exhibition opening, you can still join us for a closing reception and artists talk! As we celebrate Black History Month, we will pay homage to our ancestors who made Atlanta the cornerstone of the civil rights movement. This will be an exciting opportunity to hear from the artists who made this exhibition amazing.